Kim Weston has been painting on his photographs for over 5 years now. He started painting on his small 4x5 Platinum Photographs after our friend, photographer Ryuijie taught him the process. Kim loved learning how to print with platinum. He always believed the process was difficult to learn so he had always shied away from it. Ryuijie told him it was easy and that he could teach him in an afternoon. He was right! Even though Kim learned it in an afternoon, it took him a few months of printing until he mastered this process. While practicing how to coat the paper and learning about how to correctly expose the negative, he came away with several photographs that he felt weren't the perfect print. He hung onto to these images, couldn't bear to through them away, not really knowing what they might be used for. During this time he and his friend and mentor (oil painter) Reed Farrington decided to have a show together at a local gallery. This collaboration was of photographer and painter. Kim supplied the photographs and Reed had the freedom to paint them as he wished. It was a very well received show. Since then Kim has been painting on his on photographs, he thought well if Reed can do it so can I. 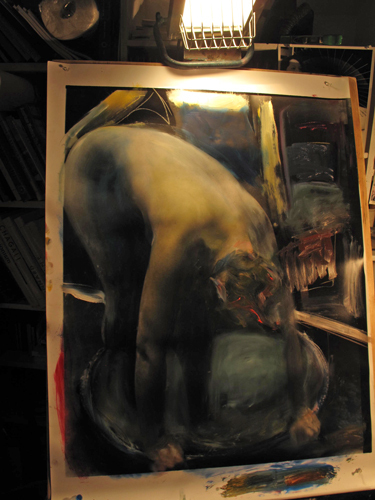 Here are a few images that show the stages of a Painted Photograph that Kim captured as he worked one night in his studio. Kim will be having a Painted Photograph Show at the Center for Photographic Art in the summer of 2012.